The Fifers slipped to a 3-2 defeat in their final game of the season. East Fife's season came to an end with what turned out to be a highly entertaining game at Bayview. The side was on the end of a 3-2 defeat in a performance which showcased East Fife at its best and worst. Again they will feel that at least a couple of Stranraer's goals were preventable with the Achilles heel of conceding from corners again haunting them. It's something boss Darren Young recognises has just cost his team far too many points and is determined to address in pre-season. But it wasn't all doom and gloom, with the Fifers showing their fighting spirit and desire to almost complete a remarkable comeback from being 3-0 down in the second half. In the end, though, they gave themselves just too much to do and ended the season with a defeat. After a pretty quiet start, the visitors raced into the lead when Scott Agnew found the top corner with a stunning free-kick. The Fifers still looked comfortable, but suddenly found themselves 3-0 down thanks to a brace of Grant Anderson headers - one from a corner. 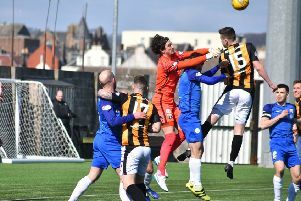 Rather than just play the final game of the season out, East Fife rolled up their sleeves and tried to get back into things. Subs Scott Linton and Kevin Smith helped turn the game and the home side reduced the deficit when Craig Watson netted a late contender for goal of the season when he burst through the heart of the Stranraer defence and sent a stunning, dipping effort beyond Max Currie from 25 yards. East Fife sensed there could still be something in the game for them and when Jonathan Page headed home a Linton corner with 10 minutes to go it set up a grandstand final 10 minutes. Young's side went agonisingly close to pulling level in the closing seconds when Kevin Smith passed up a great chance from six yards. The full-time whistle brought an end to the game and a season in which the Fifers flirted with the play-offs after the first quarter but couldn't kick on and seal their place in the top four. The goals conceded, and the manner of a lot of them, has certainly cost East Fife dearly, as have the poor points return against the sides clawing around at the foot of the league. At the other end the Fifers have been too reliant on Chris Duggan with not nearly enough goals being chipped in from others. On a positive note the side was never, at any stage, threatened with relegation, ensuring safety and a solid platform for next season. With Ayr United, and possibly still Raith Rovers, two full-time teams, leaving the division, next season should see a completely equal playing field. Even if Dumbarton come down there should be no side in the league with a better set-up than East Fife in League One, so securing safety shouldn't be underestimated. Work has already started on bringing new players to the club while others, including 'keeper Ryan Goodfellow, will depart. It's going to be an interesting few weeks to see who Young brings to the club as he looks forward to his first full pre-season at East Fife. The manager said: "There will be a few out and a few in. "We've offered contracts to some of the boys at the club and are also speaking to guys from other teams but we need to wait until the end of the play-offs to see who's going up and who's coming down. "We're working on things just now but it's been so far, so good." East Fife - Goodfellow, Dunsmore, Page, Watson, Slattery, Duggan, Millar, Livingstone (Linton 74), Allardice, Thomson, Knox (Smith 64). Subs - Mackenzie, Kane, Wilkie, Jones. Stranraer - Currie, Robertson, Neill, McGowan, Hamill, McPherson, Hawkshaw (Dykes 85), Agnew, Turner (Elliot 70), Anderson, Okoh (Scott 75). Subs - Mclaren, Barron, Gray, Baxter. Ref - Scott Millar .